Last night’s panel event was both fun and interesting. I joined John McIlveen, Bracken Macleod, Tom Deady, Pete Kahle, Andrew Boylan, and my Tuesday Mayhem Society cohort April Hawks at Pandemonium Books for a lively discussion of the horror genre, writing stuff, and other topics. I didn’t get pictures myself, but someone else snapped this one. Metal has a whole plethora of subgenres, ranging from radio-tolerated acts like Metallica and Disturbed, to the extreme. 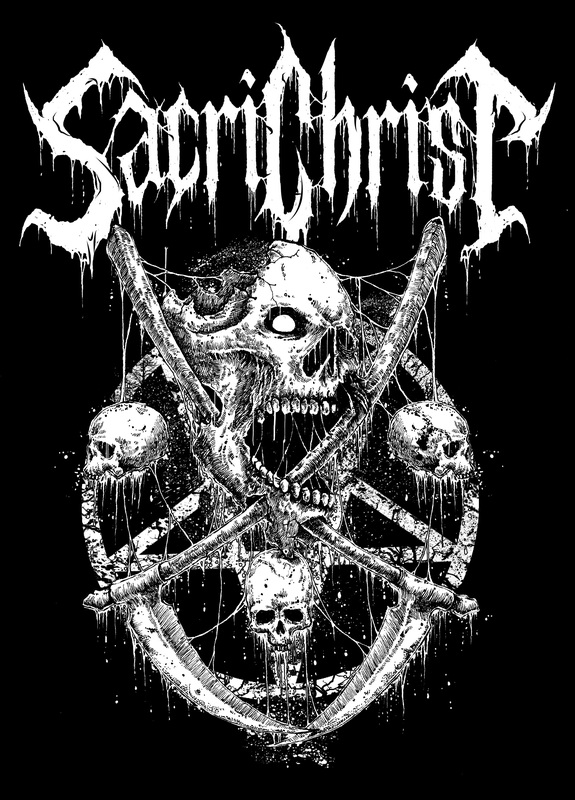 On the dark end of Maine’s metal spectrum, we have Sacrichrist, an extreme/black metal band. Aggressive, unapologetic, and brutal, black metal, for those who don’t know, goes hand in hand with cold, wintery landscapes, bleak northern forests, and, well, cold. Maine’s black metal scene may be small, but the musicians and bands can hold their own. Here’s a look at Sacrichrist, a black metal band out of Central Maine. Officially, the band traces their musical lineage back to black metal classics like Darkthrone and Venom. Brian was heavily influenced by classic black metal and extreme metal. His list of influential albums is fairly lengthy. “Bathory – The Return, Sarcophago– I.N.R.I., Darkthrone – Hate Them\Sardonic Wrath (those two albums are connected, they confirm this on the new commentary for Hate Them), Paragon Impure – To Gaius (for the delivery of Agrippina), Pest (from Germany) – Vado Mori, Satanic Warmaster – Nachzehrer, Xasthur – Telepathic With The Deceased, Horna- Sotahuuto, Leviathan – Howl Mockery at the Cross, Lord – Hell’s F*cking Metal, Ruins – Baptized in Hell, Inquisition – Obscure Verses For The Multiverse (my best black metal album of 2013), and Deadhole– The Curse of the Ghoul.” Brian’s top black metal bands are Xasthur, Darkthrone, Sarcophago, Bathory and Venom. An extremely talented and versatile guitarist, Naythen has definitely developed a unique style and often works in atonal or nontraditional structures. His solo work was the focus of a recent documentary, the Continuous Echo. “My solo material does crossover into my material with Sacrichrist,” Naythen explains, “because all my music is bound together by my Satanic beliefs. No matter what style of music I make, it is for the same drive, the same purpose, the same primitive force that is my creator.” Naythen lists the albums that were the biggest influence on him as Mayhem – De Mysteriis Dom Sathanas, Darkthrone – Transylvanian, Watain – Lawless Darkness, and Hellhammer – Apocalyptic Raids. His top five black metal bands of all time are Darkthrone, Dissection, Watain, Celtic Frost and Mayhem. Living in the Pine Tree State does have an effect on the music Sacrichrist creates. “I think it does definitely,” Brian says. “But a lot of drumming is rooted in tribal nature. Follow Sacrichrist on Facebook or Reverbnation.